The Hunting Ground, a 2015 documentary about sexual assault on college campuses exposed conflicts of interest, malfeasance and cover-ups. 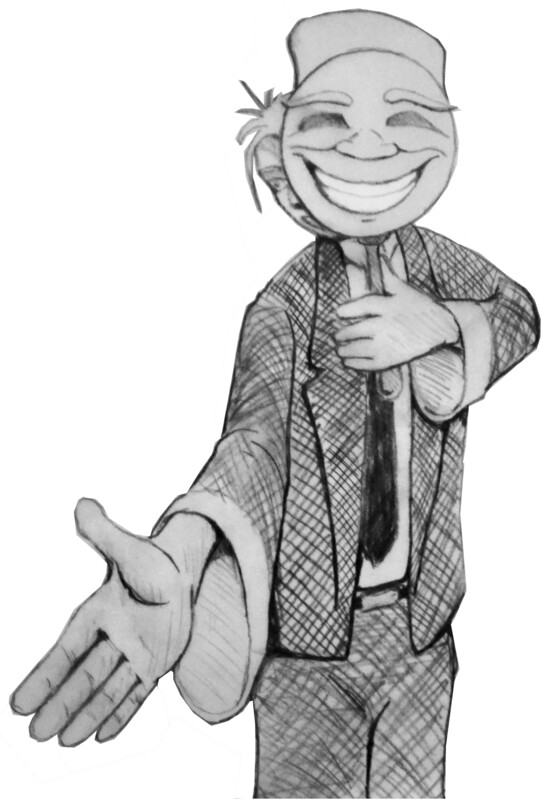 Drawing by Nicholas Boudreau, licensed CC BY 4.0. To learn about a complex topic—especially if powerful institutions have a major stake in it—we rely on experts. People who devote substantial effort toward understanding all facets of a topic can offer the public a great deal of value. We routinely refer to their perspectives and analysis when forming opinions on important social and political issues. But of course, our reliance on experts makes their interests and motivations highly significant. 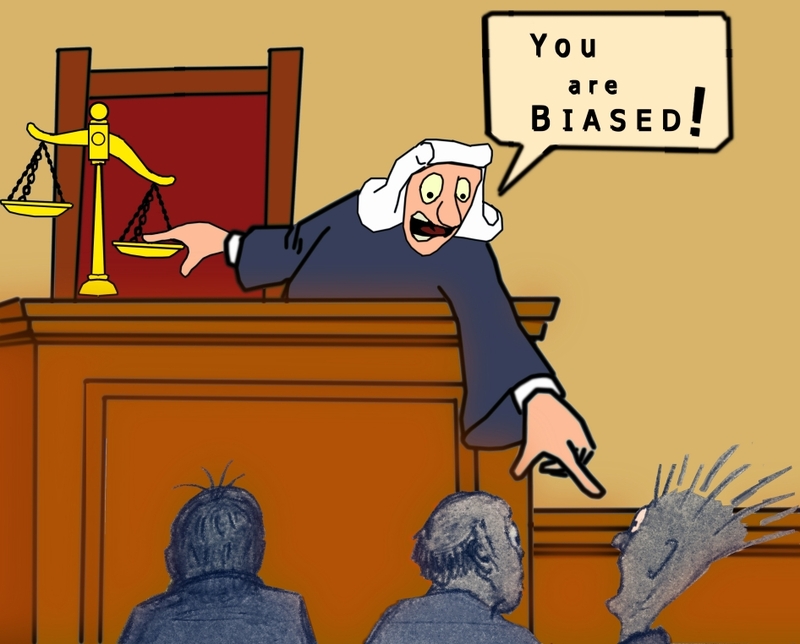 To what extent do an expert’s motivations inappropriately drive their opinions and judgments? Do those opinions and judgments color how they present the facts? As critical readers, we should always pay attention to conflicts of interest (COIs). And if they’re insufficiently disclosed, we’re at a significant disadvantage. If you learn that a product review you relied on was secretly written by the company that made it, you might feel some indignation—and rightly so. Publishers that care about accurate information face the same issue, but have a greater degree of responsibility; and if a publisher inadvertently amplifies biased information on to its readers, its reputation may suffer. So publishers establish standards and processes to eliminate COIs, or—since it’s often impossible to gather information that is 100% free of COI—to manage them responsibly. Wikipedia is no exception. 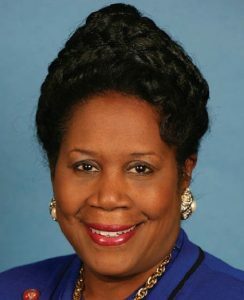 Rep. Sheila Jackson Lee of Houston, Texas. Photo public domain, courtesy of U.S. Congress. Congresswoman Sheila Jackson Lee of Houston is the latest prominent figure to confuse Wikipedia with WikiLeaks. This confusion goes back many years; it often flares up when WikiLeaks releases capture the public’s attention. In 2010, for instance, when WikiLeaks released a string of controversial documents and video, journalists including Charlie Rose turned to Wikipedia cofounder Jimmy Wales for commentary — only to learn, sometimes on live camera, that Wales and Wikimedia have nothing to do with WikiLeaks. But the mistake is an important and troubling one, especially when made by a public official. Wikipedia and WikiLeaks do not merely lack institutional ties; they also reflect profoundly divergent philosophies about the public’s role in information stewardship. Wikipedia invites everybody in the world to participate in nearly every decision. WikiLeaks, while it might solicit key information from anybody who has it, is completely opaque and centrally driven in its decisions; founder Julian Assange may be the sole decision-maker (or perhaps there is a small inner circle he consults). Any member of Congress should care about the public’s role in information management and dissemination. And anybody who cares about that topic should know, as a basic point of literacy in 2016, that Wikipedia and WikiLeaks are at opposite ends of the spectrum. 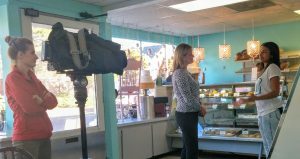 KATU news team interviews Angelica of Fat Cupcake. Photo CC BY, Pete Forsyth. 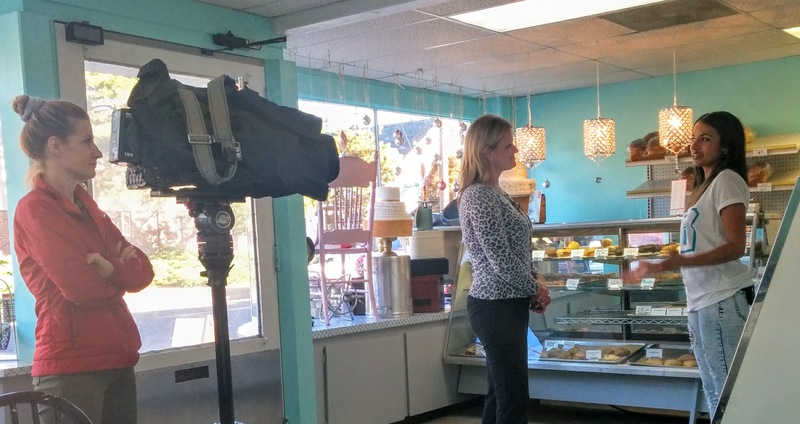 The news ain’t what it used to be…a recent story that ran in multiple Portland, Oregon news outlets took a single, anonymous Yelp comment as evidence of a “controversy.” Fortunately, I got to be at the bakery the story covered when a TV news team came in to…actually interview to sources. Angelica, owner of Fat Cupcake, poses with me and her “controversial” cupcake. Photo by KATU news anchor, at Pete’s request, CC BY. This story reminds me of how Wikipedia is often covered: two random people disagreeing over something in a Wikipedia article might be presented as an “edit war” or a “something-gate.” As the way we communicate evolves, it’s taking traditional media a while to catch up. See my full writeup on Medium. The Wikimedia Foundation (WMF) is inviting commentary on how to recognize and encourage informal leadership in the volunteer community. (The consultation runs from September 20 through October 16, 2016.) This is a welcome initiative; the Wikimedia movement has not done well, over the years, at capturing stories of volunteers who successfully focus attention on important areas, and who do good work building consensus and forging and executing plans. There are exceptions. The announcement linked above hails achievements by Liam Wyatt and Vassia Atanassova; and the WMF has consistently highlighted successful volunteer-driven projects on its blog and elsewhere. Still, many who have taken on big challenges and risks to advance our shared values and vision go unheralded. Below, I consider an important 2011 initiative and conflict, known informally as ACTRIAL (short for “Article Creation Trial”). I learned of it many months after it took place; I had to jump through jargon-filled discussions in multiple venues before I began to understand what had happened. It’s an important story, though. In recent years, WMF staff have often asserted that Wikipedia’s volunteers are “change averse,” and incapable of generating or agreeing on new ideas. But the characterization is neither fair nor accurate, and is typically asserted out of mere political convenience. ACTRIAL, however, provides a clear and valuable counterexample, in which Wikipedians self-organized to advocate for change, and WMF staff blocked the effort. This post highlights an important piece of Wikimedia history, and offers a little recognition to unsung heroes. The Blade of the Northern Lights, a Wikipedia volunteer, wanted to address a persistent problem that irks many regular Wikipedians: brand new Wikipedia volunteers who write articles that are far from meeting Wikipedia’s content standards. The Blade proposed that the creation of new articles be restricted to users with a bit of experience (“autoconfirmed”: 4 days, 10 edits), and then guided more than 500 English Wikipedia volunteers in considering and ultimately approving the proposal. I am against preventing article creation by IPs let alone non-autoconfirmed users. But this trial might well have provided compelling evidence one way or the other. 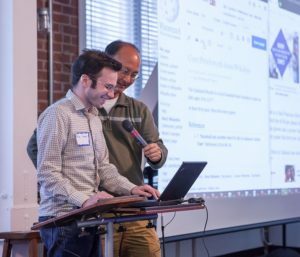 Once the English Wikipedia community had agreed to move forward with ACTRIAL, Scottywong, another Wikipedia volunteer, formally requested a necessary technical change. In a haphazard discussion driven by WMF staffers, the request was denied. 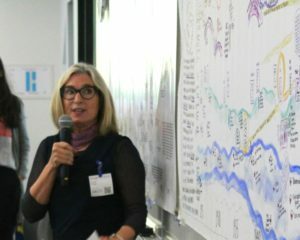 Apparently ignoring the extensive deliberation that had involved hundreds of volunteers, one WMF employee stated: “this entire idea doesn’t appear to have been thought through.” Several seemed to agree that the proposal was at odds with the strategic goal of improving editor retention, though no clear argument supporting that position was advanced. What I remember was that a pretty good number (~500) of [English Wikipedia] community members came together and agreed on a problem, and one plan for how to fix it and asked the WMF to implement it. The WMF evaluated it, and saw a threat to a basic project value. WMF then asked “what’s the problem you’re actually trying to solve?”, and proposed and built a set of tools to directly address that problem without compromising the core value of openness. And it seems to have worked out pretty well because I haven’t heard a ton of complaints about that problem since. If there was indeed an evaluation, it was never made public. While several individuals argued that a “basic project value” was at risk, no decisive case was made, nor any formal conclusion presented. Others disagreed, and the matter was never resolved decisively. If the WMF had asked “what’s the problem you’re actually trying to solve?”, the question was not (as far as I can tell) posed in a public venue. When I requested clarification, Beaudette did not respond; but James Alexander, another WMF staff member, did step in. Alexander speculated that the software inspired by ACTRIAL was the Page Curation tool. He may have been correct, but no other staff member confirmed it in that email thread; and neither the page on Page Curation nor its parent page on the Article Creation Workflow make any mention of the discussion of the 500+ volunteers that may or may not have have inspired them. Now that the Foundation seeks to explore stories of leadership in the Wikimedia movement, it would do well to look into the story of The Blade of the Northern Lights and Scottywong. These two played important roles in guiding the English Wikipedia community to define a problem, and to map out a viable (if unimplemented) way to explore a solution. Moreover, if any Wikimedia Foundation staff worked with the volunteer community to make something worthwhile out of those deliberations, their leadership merits recognition as well. What will be our Taj Mahal of text? A slide flashed on the screen—the Taj Mahal. The audience was initially taken by its physical beauty. But upon closer inspection, we were told, one would find much of the text of the Koran chiseled into this wonder of the ancient world. What a brilliant way to preserve text against the ravages of time. 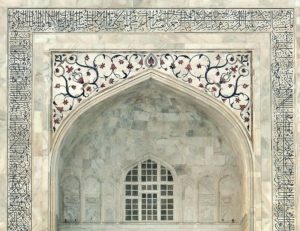 Carve the most important words into the stone of a marvelous structure. Text—its physical structure, its preservation, its manipulation, interpretation and cultural transformation—was the topic of the sixth Future of Text Symposium on the Google campus in late August. Frode Hegland introduces the Symposium. Event photos by Dan Cook, licensed CC BY-SA 4.0. 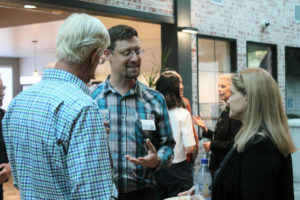 For the second year, Wiki Strategies founder Pete Forsyth was among the speakers, who each had 10 minutes to describe a particular personal text passion, followed by five minutes for questions and discussion. Wiki Strategies co-sponsored the symposium. Hegland, a teacher, lecturer, software developer and author, hosted the first Future of Text symposium in London six years ago. He intentionally keeps the crowd small, intimate and engaged; expanding to a three-day conference in a hotel ballroom is not his idea of thought leadership. His co-organizer is Houria Iderkou—without whom, he says, the symposium would not be possible. Houria is an e-commerce entrepreneur who flawlessly manages the many details of hosting a symposium. This year they again brought together leading thinkers in the various disciplines that are united by text. Among the two dozen presenters: Google hosts and innovators Vint Cerf and Peter Norvig; Ted Nelson (via Skype); Robert Scoble; Jane Yellowlees Douglas; Livia Polanyi; and Adam Hyde. The full roster can be more thoroughly appreciated here. The passions unleashed and the intellectual exchanges that occurred that day in Mountain View paid tribute to text’s contributions to human culture. For one day, the written word was celebrated as the miraculous gift to mankind that it truly is. Frode admitted to being a bit discouraged at day’s end–not by the discussions that took place, but by the weight of responsibility mankind has to hand text along from generation to generation, and to use it to its full potential to support the human endeavor. Jim Strahorn, Pete Forsyth, and Bonnie DeVarco dig into the technicalities of text. It is, after all, the accounting and preservation of the human experience, as well as an essential ingredient of that experience. When one considers what has been irrevocably lost of the experiences of humans who did not have a written language to pass their tales on to those who came after them, then perhaps Frode’s anxieties come sharply into focus. The responsibility is on us to preserve in text what we have learned, what we have seen and heard and touched and felt and smelled. So perhaps we should ask: What will be our Taj Mahal? Pete Forsyth, photo by Pax Ahimsa Gethen, licensed CC BY-SA. Wikipedia is important to the future, and important to text. How does Wikipedia cover your field? How’s that changing? 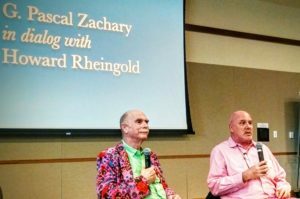 Howard Rheingold and Pascal Zachary at the Future of Text Symposium, 2015. Futurists are fond of predicting that, one day, humans will communicate telepathically, thus drastically reducing the need for the written and spoken word. Until that day arrives, however, mere mortals must continue to communicate primarily with text, a vehicle fraught with pitfalls but loaded with potential. It is the latter that will be the focus of a fast-paced, one-day symposium in the Bay Area August 25. The Future of Text Symposium is most certainly becoming one of the most esoteric intellectual endeavors of our time. And while it has been steadily evolving since first presented in 2011 at the British Library in London, the concept remains the same: Brilliant minds gather to share their most cogent thoughts on where text has been, where it is and where it’s going–and they do it within a interactive structure that keeps the idea stream rushing along in a torrent. We must say with considerable pride that Wiki Strategies is both a sponsor of this year’s FOT, and, through founder Pete Forsyth, a participant. Pete, like the others on the panel, will have his 15 minutes of, if not fame, foment–10 minutes to present his most critical thoughts on text, and what lessons about its future may be drawn from 15 years of Wikipedia, followed by 5 minutes of discussion. Peter Norvig, director of research for Google. Bruce Horn, Chief Scientist for Smart Devices, Intel and creator of Macintosh Finder. Livia Polanyi, consulting professor of linguistics, Stanford University. 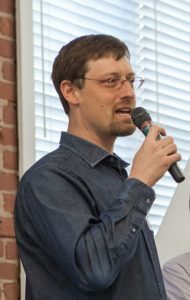 Formerly principal researcher for Microsoft, focusing on natural language processing. Heather Gold, stand-up comedian and champion of interactive, online shows. 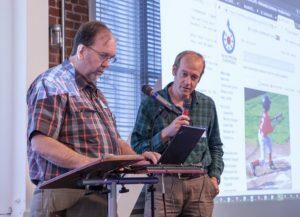 The symposium is presided over by Frode Hegland, self-described as the developer of “the powerful OS X utility Liquid | Flow and Liquid | Author, a new perspective in word processing. He is collaborating on The Time Browser project and is part of the Knowledge Federation. His co-host is Houria Iderkou, founder and owner of skin care company Néfertari. She and Frode have worked together on various projects for more than a decade, and have nurtured FOT along since its inception. We’d love to have everyone come to Mountain View on the 25th to join in the repartee, but, unfortunately, the event is already maxed out capacity wise. You see, the in crowd in the text world avidly awaits the announcement of upcoming symposia and seats disappear quickly. But we intend to do a bit of filming while we’re there, and we’ll be writing about the event in this space. So stay tuned and we’ll bring you the highlights–in text and video, and, hopefully, so robustly communicated that you will feel as though you were there in person. Some thoughts and links about Wikipedia, to support the Professional Development Workshop led by Joe Cox at the 2016 Academy of Management annual meeting. Wikipedia is the largest, and most widely read, publication in history; but perhaps more significantly, it has been built by hundreds of thousands of disparate volunteers, making it arguably the most extensive and impactful collaborative project in history. It’s based on wiki software, invented in 1995. Wikipedia was launched in 2001, initially as an experiment. 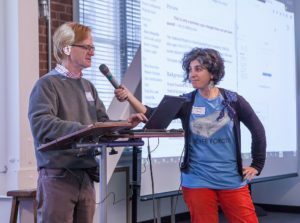 The policy framework and the social norms are as vital to Wikipedia’s identity as the software; basic principles were articulated early on, and each language edition’s volunteer community writes its own more specific policies. Why do people contribute to Wikipedia? Lavallee, Andrew (2009). Only 13% of Wikipedia Contributors Are Women, Study Says. Wall Street Journal. Editor Survey (2011), Wikimedia Foundation. So, what does contributing look like? How do professionals work alongside volunteers? Cultural institutions (GLAM-Wiki): Wikipedians in Residence, content donations/uploads, edit-a-thons. What has been tried to further engage volunteers? Wikimedia Education program: Supporting universities in engaging students as editors. Grant programs; the “Inspire” campaign. Wiki Loves Monuments, The Wikipedia photo contest around cultural heritage. Software, policies, and cultural evolution: We have to make it easy. Policies: Broad community input is necessary, and messy; process of developing/refining policy could use work. Cultural evolution: Focus has often been on remedial issues (dealing with harassment, vandalism, etc. ); focus on promoting what works well is needed. A dojo is a great place to prepare to write a wiki page! Photo by Flickr user “superwebdeveloper”, licensed CC BY 2.0. 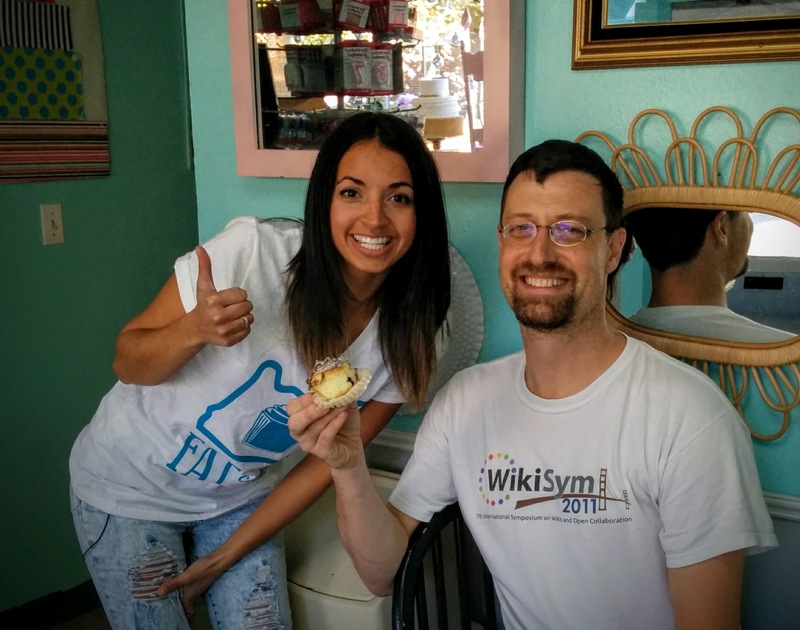 When we started the monthly Bay Area WikiSalon meetups a few months back, I was eager to try out a newly-invented way for a group to build a wiki page together. The purpose of a Wikidojo, as the event is called, is twofold. Of course, it’s a way to quickly build a page. But much more importantly to me, and to the purpose of the WikiSalon series, is that everybody involved learns something from seeing how other people approach the task. How does an experienced editor add a footnote? Where does a new editor stumble? How do you add a photo? What’s up with categories and talk pages, anyway? Watching somebody at work, and hearing them describe what they’re doing and why, can be tremendously informative and inspiring. So at our June event, I proposed that we try out a Wikidojo, and write a Wikipedia article together. It was a delightful experience, though as you’ll see below, it didn’t go exactly as I had expected! …Wayne, an experienced Wikimedian, showed Mike how to add a photo to the article. Photos by Pax Ahimsa Gethen, licensed CC BY-SA. The Wikidojo model was invented by Nikola Kalchev, inspired by Vassia Atanassova’s 2014 talk about educational approaches with wiki; and it has been conducted in many places around the world. I learned about it from my friend Asaf Bartov, and was immediately drawn to the seductively simple idea: everybody takes a seven minute turn at building a wiki page, as the “pilot.” Every pilot has a “copilot,” who engages them in discussion during their shift. And everybody else gets to listen and absorb what’s going on. Asaf (and various online writeups and videos) had warned me of the common pitfalls. Above all, I was supposed to be rigid on one point…ensure that the audience keeps quiet! That’s necessary, I was assured, to permit the “magic” to develop between the pilot and the copilot, and to permit each team to approach the task in their own way without too much interference or distraction. Well, there’s only one thing to say on that point: I failed. After the very first round, I was seduced by an eager participant to mix it up. Our second copilot wanted to act as a facilitator, moving around the room with the microphone, to take suggestions and comments from the audience. To be honest, I didn’t want to do that — I knew this was just the thing Asaf had warned me about. But I’m a sucker for enthusiasm, and our copilot had it in spades. So we gave that a shot. To my eye, it made it more difficult for the pilot, who had a cacophony of ideas coming from multiple sources, making it difficult to chart his own course — which is the main thing Wikidojo is designed to showcase. It was also difficult to get back to the original format, as the audience enthusiasm for voicing suggestions lasted into the later rounds. But, my preferences aside, a show of hands afterward (9 to 7 vote?) indicated it was actually the preferred approach. So, this might be a variant to be explored further. As I see it, there’s so much experimentation built into the activity to begin with, that changing the format midstream is disorienting. I’d advise anyone trying a Wikidojo for the first time to be clear about the rules from the beginning (one way or another), and stick with them throughout the event. This photo was already stored on Wikimedia Commons, making it accessible for inclusion in an article. Photo by Flickr user “wildernice,” licensed CC BY 2.0. Another factor that made it tough to stick to the original format was…me. I wasn’t so great at following my own rules! Several times, I jumped in with suggestions for the pilot and copilot. I tried to restrain myself, but in some cases I think it was the right thing to do. For instance, the topic we had chosen has only sparse media coverage, and because I had researched it prior to the event, I knew some approaches to searching that would prove to be time-consuming dead ends. I didn’t think having a team take up most of their seven minutes in a fruitless search would be very satisfying, so I intervened. And at another point, a new wiki editor suggested adding an image to the article. He wasn’t worried about it being perfect for the article, as he was mainly interested in learning the process; the pair seemed poised to run a time-consuming search for an image which, at best, would have yielded a photo under copyright, and complications that couldn’t be resolved in the allotted time. 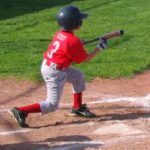 I again jumped in, to suggest adding an unrelated photo of a child playing baseball. I think it was a good suggestion, as it permitted them to successfully post a picture in the time allotted. Overall, I had a lot of fun, and am looking forward to trying it out again. Before encountering the Wikidojo model, I have often wanted to engage a larger group in improving an article in person, but I didn’t see any effective way to do it. Edit-a-thons tend to follow a less formal structure than Wikidojo; at an edit-a-thon, smaller groups typically form. That’s a great approach too, but can limit cross-pollination of ideas. Wikidojo is much better suited to a shared experience and shared learning. The informal feedback I heard was positive; participants enjoyed watching each other work, and a number of people learned new wiki skills. There were some good suggestions, as well; I have collected more detailed notes and feedback on this wiki page. The next time I do it, I think I’d choose a less esoteric topic, that’s easier to research, and that the audience already knows to some degree. But even with a few unexpected twists and turns, it was a lot of fun, and it stimulated some great discussion about how different people approach wiki. 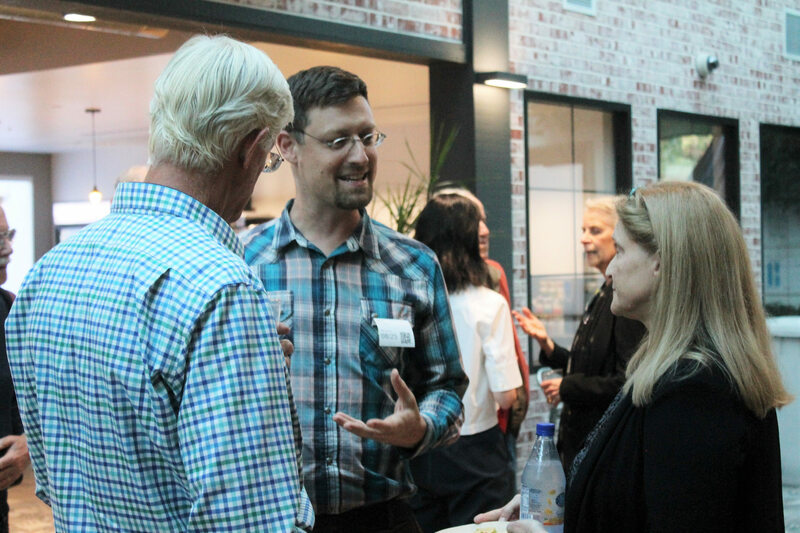 Our June event also featured an informative and fun presentation by staff of the San Francisco Public Library and OCLC; watch the video here. And this month, we look forward to a meetup at San Francisco hacker space Noisebridge, in which we’ll focus on the Wikipedia article on basic income.